Elmo and Marco pair up to have some fun running through the Electric Jungle, a brightly-colored obstacle course built for two. One player controls Elmo, who rides on the shoulders of Marco, controlled by player two. While the duo runs, the player controlling Elmo must duck to avoid tree limbs and reach upward to collect butterflies. The one controlling Marco must lean left and right to avoid boulders, jump to leap over felled trees. There you have it, co-op is confirmed thanks to the hands-on preview over at Kotaku. That's not all though, the storyline is explored a bit, and fun was had by not-kids (though it's expected that kids will enjoy this most of all). 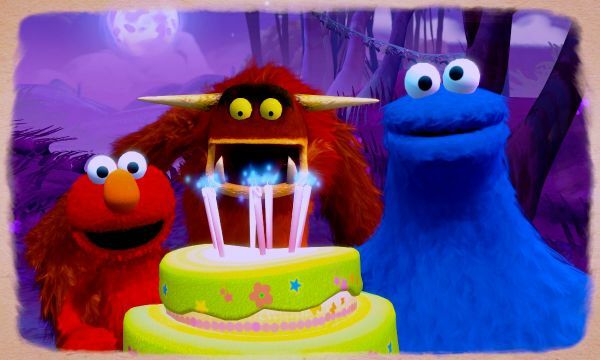 As Sesame Street games go, it's cute, charming and impossible to hate. It may be a game designed with kids kids, but basking in the big smiles of Elmo, Grover and Cookie Monster, playing these simple motion-controlled games, it's hard not to feel like a kid yourself. Parents, children, and inner-children of adults should enjoy this simple Kinect-filled fun. If you're still looking the other way - you didn't grow up with Jim Hensen's puppets teaching you the power of laughter, and you don't love co-op. (Or you may not have a Kinect, which is understandable if you're tight on space or cash). Page created in 0.7736 seconds.